One Woodrow Wilson Plaza, 1300 Pennsylvania Ave., NW, Washington, D.C.
On Thursday 3 December 2009, Adam Michnik, the well-known Polish democracy campaigner, will be presented the 2009 Ion Ratiu Democracy Award and deliver the 2009 Ion Ratiu Democracy Lecture at the Woodrow Wilson Center in Washington , D.C. He will be introduced by Zbigniew Brzezinski, former National Security Adviser to U.S. President Jimmy Carter, 1977-81. The welcoming remarks are by Wilson Center President and Director, Lee Hamilton and by Ratiu Foundation Chairman, Nicolae Ratiu. Adam Michnik is the Editor-in-Chief of Gazeta Wyborcza, Poland’s largest daily newspaper. Historian, essayist and political publicist, Michnik was one of the leading organizers of the illegal, democratic opposition in Poland between 1968-1989. He was a founding member of the Komitet Obrony Robotnikow (Committee for the Defense of Workers) in 1976 and a prominent activist during the Solidarity movement in the 1980s. He participated in the Round Table Talks of 1989, and was later elected to Poland 's first non-communist parliament, where he served from 1989-1991. Michnik is the author of several books, including Letters from Prison and Other Essays (1987), The Church and the Left (1993) and Letters from Freedom: Post Cold War Realities and Perspectives (1998). The purpose of the Ion Ratiu Democracy Lecture (IRDL) is to bring visibility and international recognition to the ideas and accomplishments of individuals around the world who are working on behalf of democracy. The event expresses the deep commitment to democracy of the late Ion Ratiu through his contributions as a Romanian politician as well as his interest in democratic change worldwide. The Ion Ratiu Democracy Lecture aims to replicate for campaigning democrats today, whether in exile from repressive regimes or representative of today's emerging democracies, the life-changing experience in Washington , D.C. , of the Romanian democrat, Ion Ratiu, in the 1970s and 1980s. Ion Ratiu (1917–2000) was the most outspoken and consistent voice of opposition to Nicolae Ceausescu, whose regime he opposed for years from London as the democratically elected leader of the World Union of Free Romanians. Journalist, broadcaster and author, he was also a successful businessman in shipping and property, while simultaneously operating as a kind of Scarlet Pimpernel, assisting in the rescue of many who fled from Ceausescu’s dictatorship. After fifty years in exile he returned to his homeland in 1990 to contest the presidency. Although he won a seat in Parliament, and was to serve his country for his last ten years, his failure to win the presidency was a disappointment to many. Even nowadays, on Romanian streets, Ion Ratiu is remembered fondly, often referred to as “the best president Romania never had”. “By offering Adam Michnik the 2009 Ion Ratiu Democracy Award, the Ratiu Foundation wants to pay homage to a great democrat, a most worthy example of all those men and women all over the world who choose to take an active role in making democracy a way of life, often facing persecution. The 2009 Ion Ratiu Democracy Lecture at the Woodrow Wilson Center is the fifth event in a series begun at Georgetown University in 2005 and held at the Woodrow Wilson Center since 2006. Past awardees include Sergio Aguayo (Mexico, 2005), Saad El-Din Ibrahim (Egypt, 2006), Anatoli Mikhailov (Belarus, 2007), and Eleonora Cercavschi (Moldova, 2008). 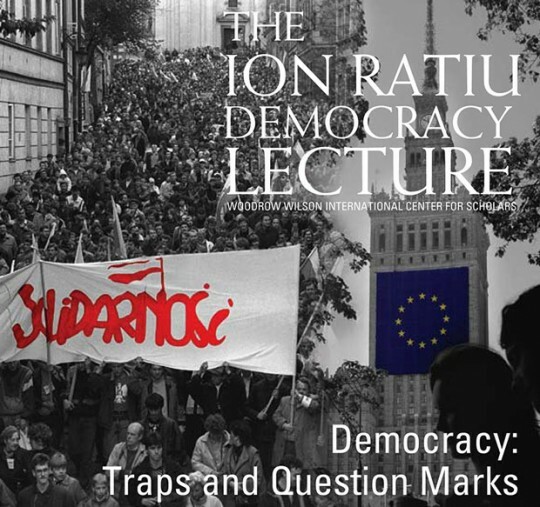 The Ion Ratiu Democracy Lecture is organised by the Woodrow Wilson International Center for Scholars in Washington, the Ratiu Family Charitable Foundation in London, and the Ratiu Center for Democracy in Turda, Romania. With the support of the Embassy of Romania in Washington D.C., RH Printing, and DHL.